The Comparative Law Yearbook of International Business, published under the auspices of the Center for International Legal Studies, covers the up-to-date development of laws in the area of shareholder liability. 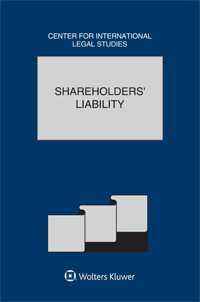 Shareholder liability was once discussed only in terms of liability for the debts of the corporation in which the shareholders hold interest. This scene is now shifting, influenced primarily by the emergence of shareholder activism and derivative litigation, with its attendant increase of risk for officers and directors, and “fee shifting” provisions in corporate bylaws, allowing corporations to seek legal fees from unsuccessful shareholder plaintiffs. In this edition of this yearbook, practitioners from ten jurisdictions examine recent developments in shareholder liability. The introductory chapter “Liability of Shareholders in Modern Company Law” sets up the stage for the analysis of the country reports of Argentina, Belgium, Brazil, Croatia, Germany, Indonesia, Mexico, Portugal, and the US. As a scrutiny of the updated developments in the legal fields by practitioners and experts, this yearbook helps readers gain insight into national and regional perspectives on the interpretation of legal laws relating to shareholder liability across boundaries. The presentation of the model and cases of jurisdictions helps to understand where the decision-making power of the company should lie and also on how to ensure that the management is properly supervised for the best interest of the company and the shareholders. Thus, this book serves as a source of knowledge to lawyers and academics to comprehend the changing scenario of shareholder liability and to confidently apply these legislations in practice.